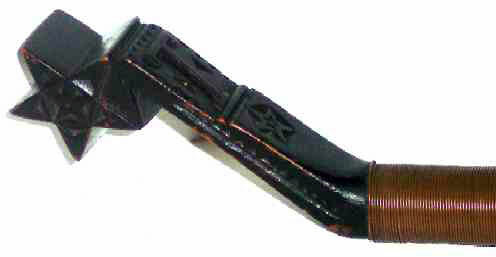 "Crooked" Knives were made by Indians, as well as by hunters, loggers and trappers in the the Northeast U.S. and Nova Scotia. They were used for work that required pulling the knife toward the holder . . . splitting wood for basket splint, cutting hide for lacings and for skinning animals. Crooked knives are relatively rare, and value is largely determined by the originality of the carving. This one, a fine example of American Folk Art was found in Maine and has a wonderful "Star" carved handle as well as another star at the base of the handle. The letter "T" is also carved prominently at the top of the handle. There is also chip carving and cross-hatching on each side of the handle. 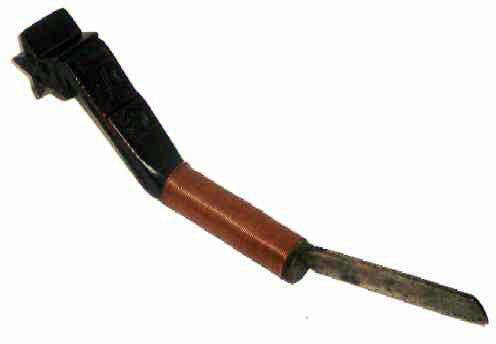 The blade is affixed to the handle with wrapped copper wire. Excellent painted surface of handle attests to use, but not abuse. All in all, a very nice example of a utilitarian object elevated to another level due to the decoration and can indeed be viewed as folk art.